Call us on 01264 737279 or email contact@thegeorgeatvernhamdean.co.uk to book now! 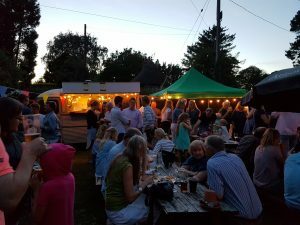 Our annual beer festival is back from Saturday 25th August – Monday 27th August, 12pm-late. Join us for a long weekend of great beers and ciders, fantastic live music, delicious wood-fired pizzas and BBQ. 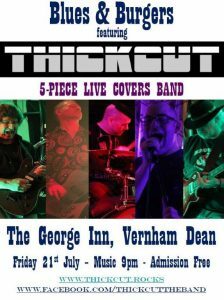 Further details of the line-up and beers will be released in due course, follow us on facebook (https://www.facebook.com/thegeorgeatvernhamdean) to get all of our updates! 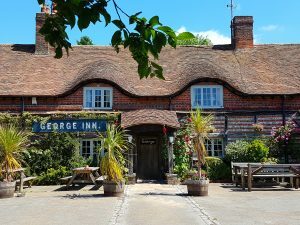 Love is in the air at The George! Why not treat your loved one to a delicious meal for Valentine’s Day where we have a wonderful set menu for a night of romance. Looking for somewhere to go for New Year’s Eve? Well look no further – we have teamed up with Juanita Hennessy (Masterchef finalist 2016) and have a delicious 4 course set menu planned, with music from 9:30 from the fantastic Soul Searchers. Call or email us on 01264737279 or contact@thegeorgeatvernhamdean to book a table! We are now taking bookings for Christmas parties – whether it be a work party, family get-together or cosy dinner for two, get in touch to book your table now! Our Christmas menu is available from 1st – 24th December. Our kitchen will be closed on Christmas Day itself, but we will be open for drinks between 12 and 2pm. chilli dogs set to a background of blues music and old-school rock provided by ThickCut.